As the TTC faces budget cuts during its 90th anniversary month, a look back at its beginnings as the successor to a decrepit, underfunded transit provider. Unveiling the streetcars of the future, courtesy of the Toronto Transportation Commission. The Telegram, August 24, 1921. Night. But there is nothing subdued about the lighting in the great panelled room, with its woodwork of Flemish oak, its mahogany doors, its wall paper of heavy bronze blackened somewhat with age. In the canopy above the brick fireplace where fires have never been known to burn is a bronze bust of Queen Victoria—the sole ornament of the place. The tall chairs are of the period Jacobean; the huge table of some other period. There is a great red rug worn at the edges by the feet of many shareholders. It is a queer jumble of a room, yet somehow achieving a certain “homieness” [sic] which the bells of St. James’ accentuate…But the place is lifted out of cosiness and into the realm of cold business utility by its brilliant lights…For at the corner of King and Church street there is a gathering of the mourners and some not so mournful. They have come to attend the wake of the Toronto Railway franchise demised at the age of thirty years. Powerful figures like Robert John Fleming, R.C. Harris, and Sir William Mackenzie watch as the papers awaiting signatures are passed around the room. By quarter to two, the deed is done. No longer is the city’s streetcar system primarily in the hands of the privately operated Toronto Railway Company (TRC). Outside the office, overnight commuters are taking their first ride on the fleet of the now publicly owned Toronto Transportation Commission. car numbers 2094-2112, including even numbers. Photo by Alfred Pearson, 1921. City of Toronto Archives, Fonds 16, Series 71, Item 1449.”] As we mark the 90th anniversary of the TTC’s assumption of Toronto’s public transit needs this month, we find that issues like rising fares, aging vehicles, and cuts to maintenance were just as relevant then as they are now. Those whose fervour for cuts forces the TTC to reduce service levels, abandon needed system expansion, and delay vehicle replacement may create a transit future that resembles the condition of the TRC by 1921. And its condition was not so good. 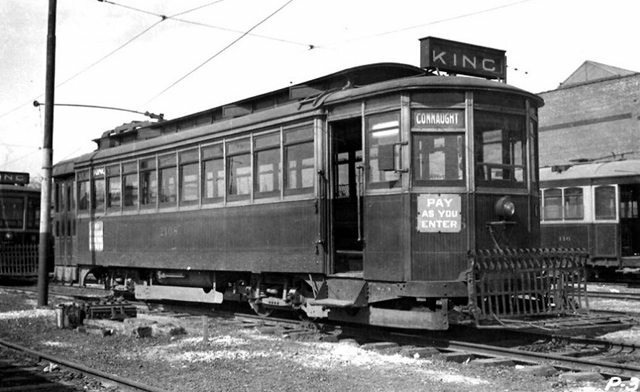 By the second decade of the 20th century, the financial difficulties TRC owner Sir William Mackenzie experienced with his other railway interests reduced the amount of money poured into the streetcar system. Anxiety about the approaching end of the TRC franchise played a role in the TRC’s decision to avoid long-term investment in its network by maintaining it at a barely functioning service level. One method of saving a buck was to argue successfully in court that the franchise didn’t require that new track be built outside the boundaries of the City of Toronto as they were delineated in the early 1890s. By the end of the First World War, the TRC operated a fleet of decrepit streetcars that were overcrowded and that couldn’t cope with rush hour demand. As the end of the franchise approached, the TRC saw little need to undertake massive track repairs or upgrade repair shops that were built for horse-drawn vehicles. The TRC’s actions resulted in the City forming its own transit company, Toronto Civic Railways (TCR), in 1912. Via unlinked routes, the TRC serviced annexed areas like Danforth Avenue, St. Clair Avenue, East Toronto and the Junction. To add to rider confusion, suburban networks like the Toronto & York Radial Railway and the Toronto Suburban Railway also ran lines into the city through areas the TRC refused to extend. By the end of 1919, it was theoretically possible for a rider to pay nine separate fares in the city, with no transfers between any of them. The first batch of TTC fare tickets. The Telegram, August 26, 1921. This situation couldn’t continue. 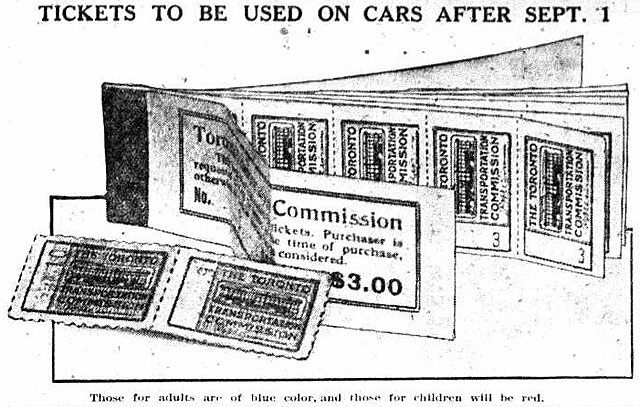 The solution, approved by Toronto voters on January 1, 1920, was the establishment of a publicly operated commission that would merge all of the City’s transit networks into one body once the TRC’s franchise expired. Over the next year and a half, the TTC planned track repair and construction to link routes, the purchases of new Peter Witt streetcars, and a PR campaign to counteract the bad reputation of the TRC.